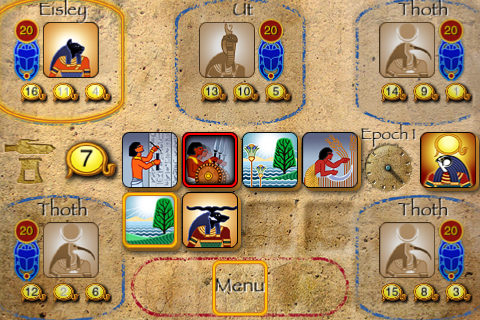 Ra is one of Reiner Knizia’s classic games. In this case, it’s an Egyptian themed auction game. Players take turns either adding a random tile to those to be auctioned, or they can start an auction for the already drawn tiles. If a Ra tile is drawn an auction is automatically initiated. Three times during the game, the players score points (depending upon the type of tiles) for the tiles they have won, but the heart of the game is the clever, yet simple, bidding system. Priests of Ra is based on the classic game Ra, also by Reiner Knizia. I shall be reviewing Priests of Ra as if not having played the original game because not everyone has played the original game and it is important to see it for the game it is and not just the comparison. I’ll add comparisons separately at the end.